NDA candidate Harivansh Narayan Singh won a thumping victory in Thursday’s elections to the post of the deputy chairman of the Rajya Sabha. BK Hariprasad 105 votes, four fewer than expected. Singh, who belongs to JD(U), won by 20 votes. The Shiv Sena voted in the election. This raises the query; does the opposition need to revisit its strategy? Is this election result a sign of what is going to happen in the 2019 general elections? 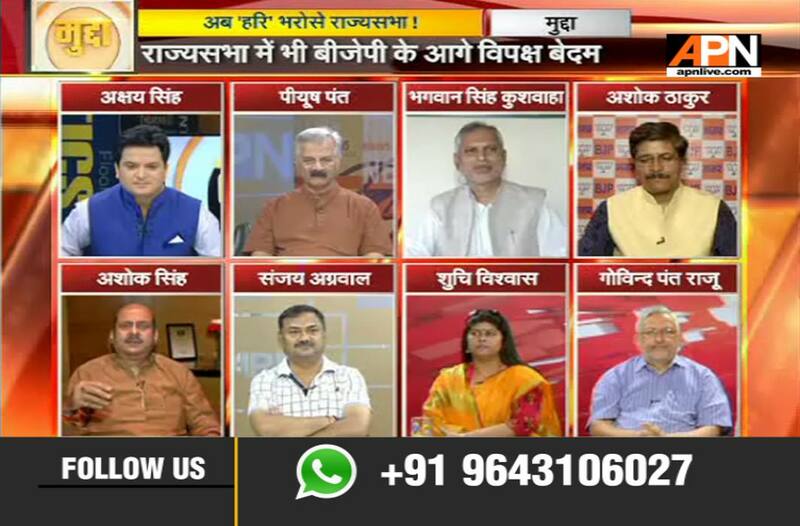 APN’s afternoon debate Mudda examined this with Akshay Singh Gaur leading a discussion among senior journalists Govind Pant Raju and Piyush Pant, BJP spokesperson Ashok Thakur, SP speaker Sanjay Agrawal, JD(U) Bihar chief Bhagwan Singh Kushwaha, RJD Maharashtra head Ashok Singh and Congress spokesperson Suchi Biswas. “This loss has deflated the balloon of hype regarding the so-called future grand alliance of the opposition. The alliance is the hope of the opposition, and it is a natural one. But it does not exist yet. So I don’t think this is a setback because there is no surprise in the outcome. Also, there is in fact no chance of the alliance coming together. Congress chief Rahul Gandhi did not even exchange a word with AAP chief Arvind Kejriwal. You can draw your own conclusions,” Raju said. But Agrawal felt that the opposition could have won this election, so it is a setback. “They must introspect and have detailed talks,” was his suggestion. But he was hopeful about the outcome of the 2019 general elections. Thakur said that Hariprasad’s loss was a sign of the times to come. But does the whole credit belong to the BJP or did Nitish Kumar have a role to play? Thakur seemed to favour the former. Singh smelt a rat, saying MPs had been bought over. There was no opposition whip, he said. “The NDA government has tarnished the tradition of free and fair elections,” he said. The BJP takes thorough preparation and leaves no stone unturned when it comes to winning elections. The opposition does not stand a chance in 2019, opined Piyush Pant. “The Congress should have approach the smaller partners of the NDA alliance before this ballot,” he added. “We should work for the good of the country rather than the party. After 42 alliances, Modi is PM; so everything is possible,” Biswas said. “RJD indulges in big talk. Nitish never engages in mudslinging. It is Nitish’s hard work and strategies and the strength of the BJP-JD(U) ties that have borne fruit,” Kushwaha said.